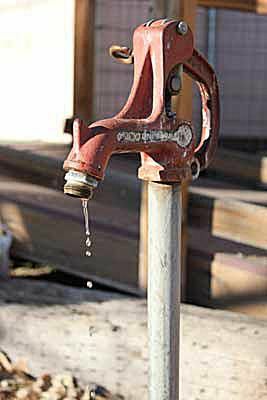 A frost-free yard hydrant repair can be as simple as replacing the rubber seal on the faucet mechanism of the hydrant. This means you can leave the hydrant's long standpipe in place (no digging!) and simply unscrew the hydrant head to replace the seal. When the seal begins to fail, water leaks out through the hydrant, and it leaves water inside the hydrant that can freeze in cold weather. That's why it's important to make the yard hydrant repair before it ​gets too cold. There are many types of yard hydrants, and it's important to get the exact replacement parts for your model. Many hydrant manufacturers offer repair kits for their products. Check with the manufacturer or shop for parts online or through a local plumbing supply house. Shut off the water supply to the hydrant. There may be a shutoff valve directly on the water line supplying the hydrant. Look in the basement or crawlspace for lines that exit the house into the ground (water hydrant lines are buried below the frost line, the depth to which the ground freezes in winter). If there's no shutoff valve on the individual line, turn off the water at your home's ​main shutoff valve. Remove the hydrant head from the standpipe, using two pipe wrenches. Hold one wrench on the standpipe for support, and use the other wrench to unscrew the hydrant head. The wrenches should face in opposite directions. If the head won't budge, apply some penetrating oil to the threads under the head; a spray is best because it can spray upwards into the threads. On some hydrant models, you must loosen a linkage setscrew and/or a packing nut on the head before turning the head. Do not remove the setscrew or packing nut; just loosen them. Carefully pull up and remove the long riser rod (also called an operating rod) from inside the standpipe. If necessary, grip the rod with pliers to remove it; use pliers only on the outer portion of the rod, not the brass spindle. Unscrew the rubber seal from the end of the rod, using a screwdriver. Install the new rubber seal and secure it with the screw. If desired, apply a silicone waterproof plumber's grease to the seal to help it slide into the hydrant. Do not use petroleum-based lubricant, which can damage the seal. Reinsert the riser rod into the standpipe until the seal is fully seated at the base. Clean off any old plumber's tape or pipe-joint compound from the standpipe threads. Apply new plumber's tape to the threads, then screw on the hydrant head. Tighten the head so it is snug and facing the desired direction. Retighten the setscrew and/or packing nut, if applicable. Turn the water back on and check for leaks. If the hydrant still leaks, or if the rod is damaged, you may need to dig up and replace the yard hydrant.